Dragonflies are creatures of superlatives. They have the ability to fly in any direction, with their four wings rotating and moving independently. The largest known insect was a fossil dragonfly with a 30-inch wingspan. It would be amazing to see them, though if they got angry they could be intimidating. They are fierce predators, both in the water during their larval phase, and also on the wing as adults. They are aggressive and effective, catching up to 95% of their prey, and eating over 10% of their body weight every day. So I’m happy to be way bigger than them! They are able to see nuances of colors invisible to us. Like many animals we see colors based on three proteins in our eyes that sense red, green and blue. 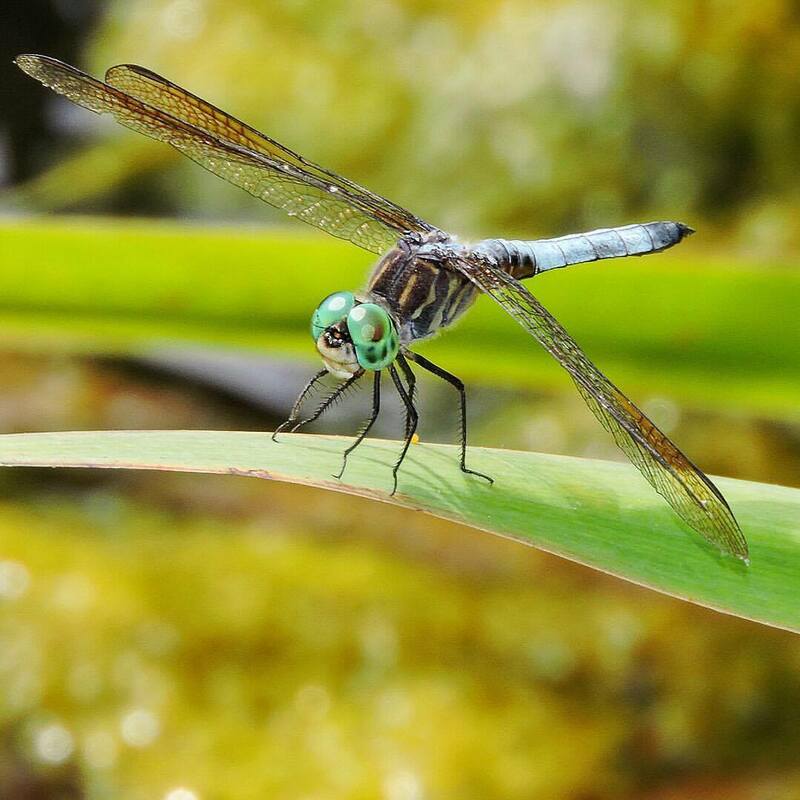 Dragonflies have at least 11, and up to 30, of these light sensitive proteins, and are also able to see ultraviolet. They have the largest eyes in the insect world, occupying most of their heads. Each eye may have up to 30,000 facets, capable of seeing in almost every direction at once. So as I pause to observe them, I am sure they can see me even better, in ways I can’t even imagine. It has been a very warm and mild autumn so far with summer lingering longer, many days well into the 80s. Because of this, insects are still very active. I have seen damselflies and dragonflies here later than ever before. This blue dasher is commonly found throughout the U.S, usually the most common species where it is found. Some of them have been observed to migrate. Its cousin the globe skimmer has the longest known insect migration, flying across the ocean as part of its 11,000-mile journey. As he flew off I wondered where his winter journey might lead him, and if I would see him again next year. Every day nature offers within the ordinary something extraordinary if we take the time to stop and see. This flying dragon might lack the drama of a fire-breathing reptile, but I was thrilled by the moments we shared.